Gently soothes and moisturizes your skin. Used to counteract premature aging of the skin and may also help reduce the appearance of fine lines and wrinkles. 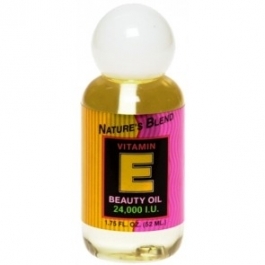 Vitamin E is a premier anti-oxidant used in the healing of scar tissue. Use as a part of your nightly beauty regimen, paying close attention to fine lines, wrinkles or rough skin on face and neck. Ideal for softening elbows, knees, hands and other problem areas.